YOU ASKED IF WE EVER HAVE SALES. WE ALMOST NEVER DO. SO NOW'S YOUR CHANCE TO SAVE ON OUR WONDERFUL ORGANIC AND NATURAL GREEN DREAMS™ UPHOLSTERED BED FRAMES! This gorgeous upholstered bed frame features an inclined, button-tufted headboard with a curved top and curved, solid walnut legs for visual balance. 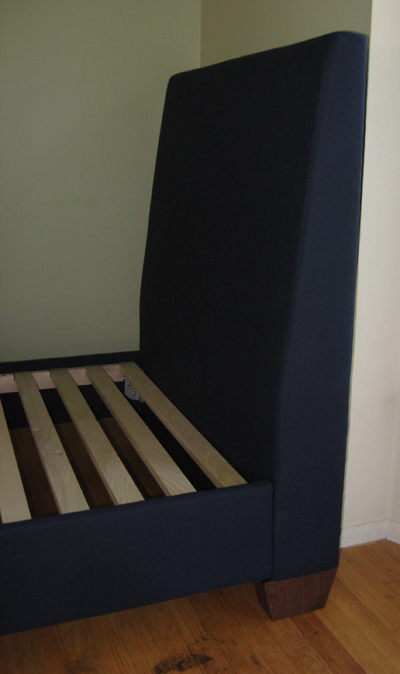 The headboard is padded with natural latex and organic wool for comfort while sitting in bed. 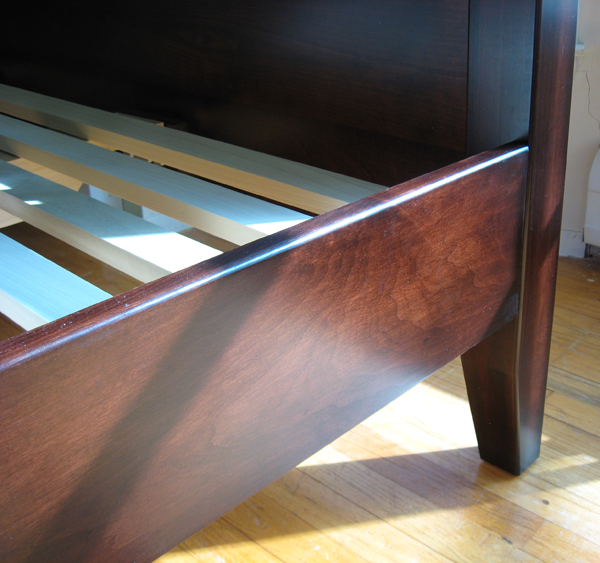 The footboard has turned legs that tie into the turned legs on the night stands. Constructed by Amish craftsmen with a solid, kiln-dried maple frame upholstered with natural and organic materials Feet are available in oak, maple, cherry and walnut. 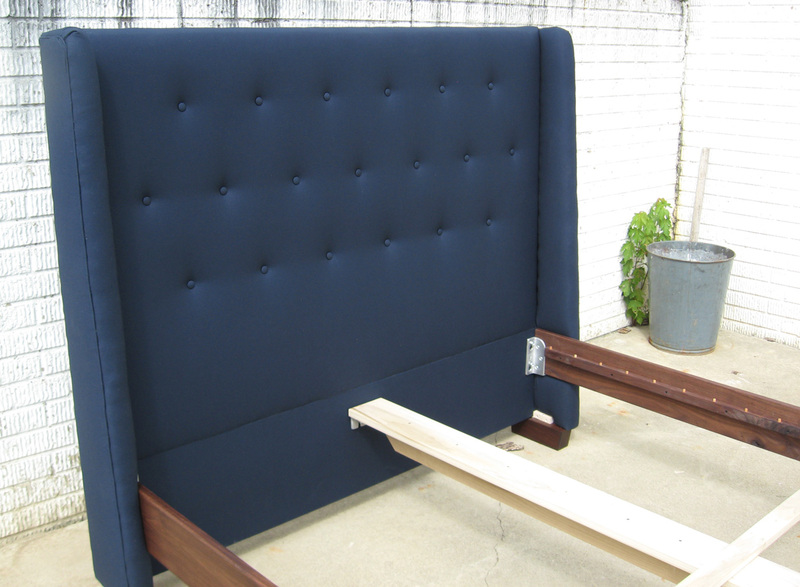 Headboard height is 61" high on the king, but may be ordered with a different height (price may vary). Since each bed is made individually, we work with you to adjust the features for your particular needs. Simple assembly. 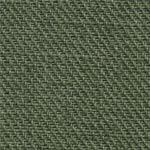 Your choice of natural hemp or organic cotton fabric See our list of just some Fabric Choices below for more information. 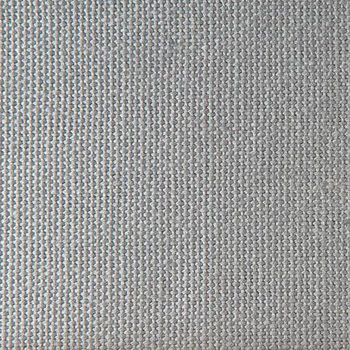 Fabric samples available upon request. 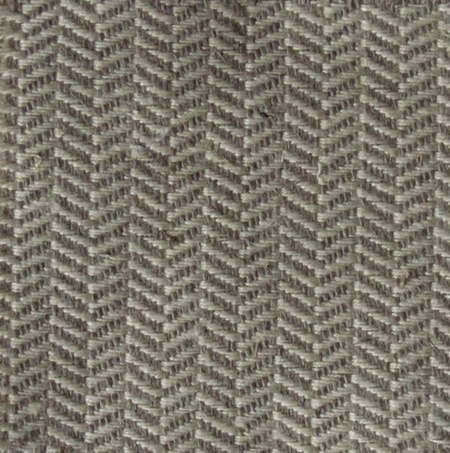 Price of bed frame may vary with certain custom fabric choices. This modern upholstered bed frame has an inclined headboard padded with natural latex and organic wool for comfort while sitting in bed. Constructed by skilled Amish craftsmen with a solid, kiln-dried maple frame upholstered with natural and organic materials. 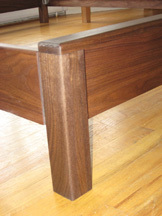 Note the tapered, solid walnut feet. Feet are available in oak, maple, cherry and walnut. 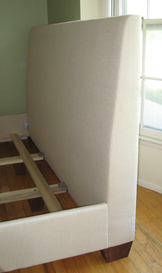 Headboard height is 46" on twin and 48" on king, but may be ordered with a different height (price may vary). 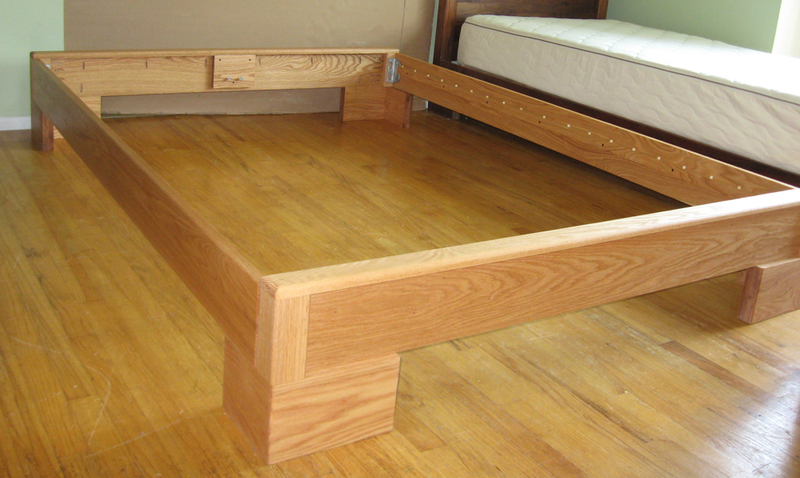 Since each bed is made individually, we work with you to adjust the features for your particular needs. Simple assembly. This lovely bed combines a solid-wood frame with a button-tufted, upholstered headboard using natural and organic materials. 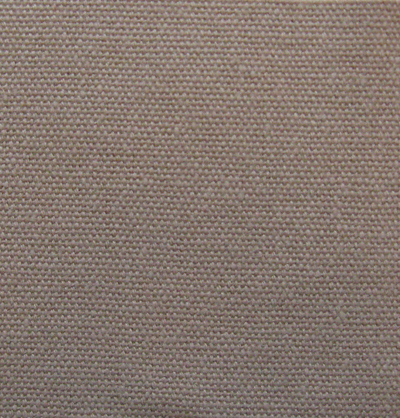 Headboard is generously padded with 100% Natural Latex and organic wool. Headboard is 52" tall as pictured, but may be ordered other heights. 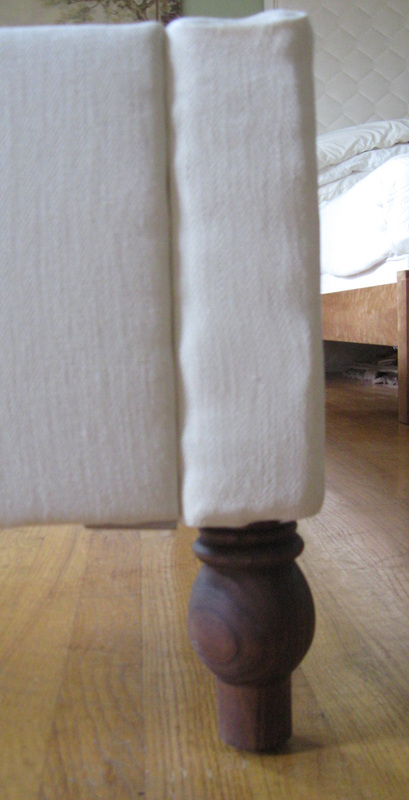 This bed frame has tapered legs. 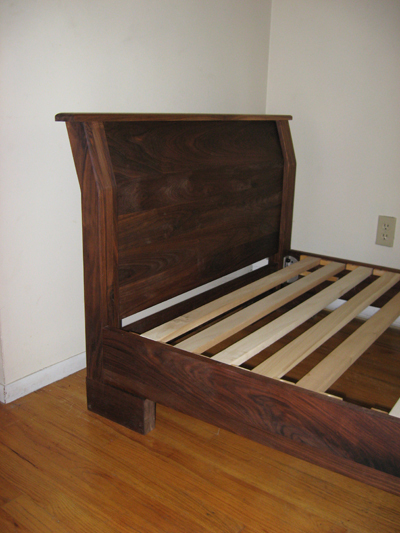 Wood choices for the bed frame are oak, maple, cherry, walnut and hickory. Wood is inished with oil and beeswax. Since each bed is made individually, we work with you to adjust the features for your particular needs. . This charming bed combines a solid-wood frame with a button-tufted, upholstered headboard using natural and organic materials. 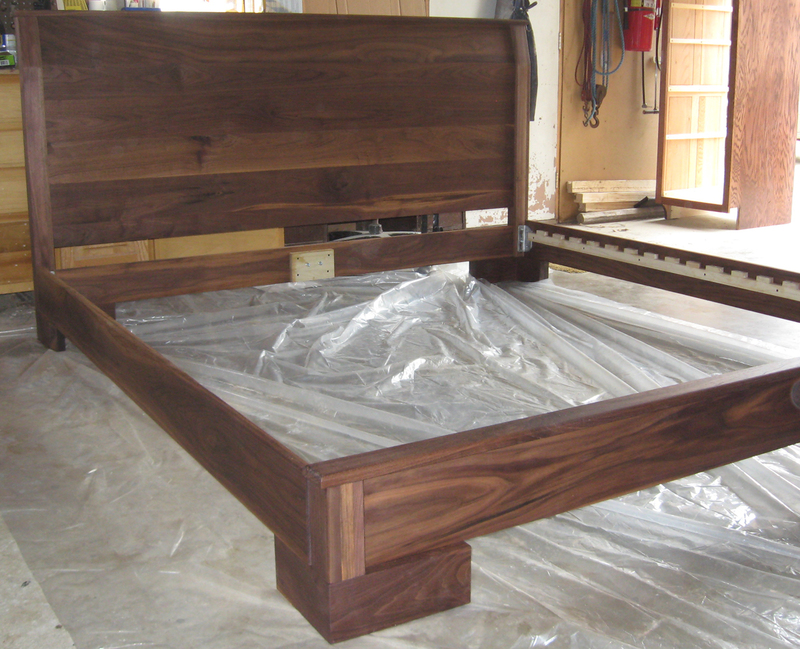 Headboard is 60" tall as pictured, but may be ordered shorter.The bed pictured was custom made with extra tall legs to create storage space underneath for a downtown apartment with limited space Wood choices for the bed frame are oak, maple, cherry, walnut and hickory. Finished with oil and beeswax. Since each bed is made individually, we work with you to adjust the features for your particular needs. . This lovely bed combines a solid-wood frame with a button-tufted, upholstered wingback headboard using natural and organic materials. 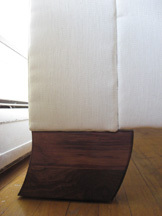 Headboard is generously padded with 100% Natural Latex and organic wool. 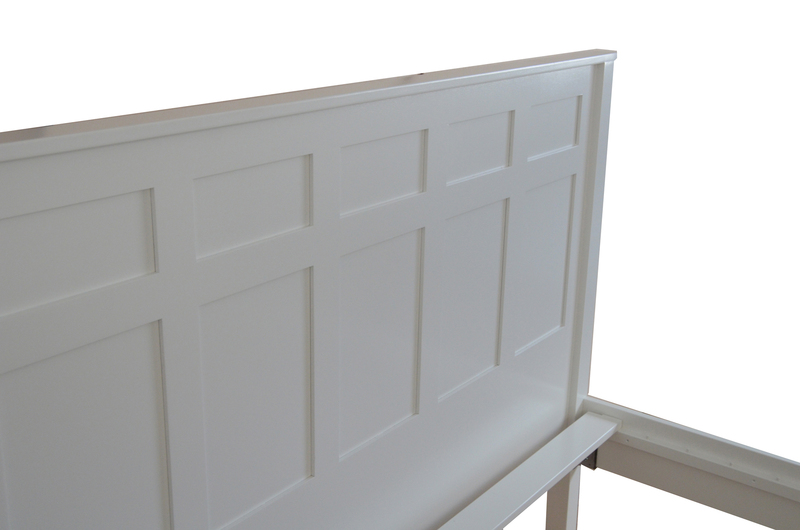 Headboard is 56" tall as pictured, but may be ordered in other heights. This bed frame has tapered legs.Legs may be ordered turned instead of tapered. 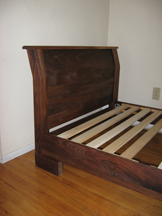 Wood choices for the bed frame are oak, maple, cherry, walnut and hickory. Wood is inished with oil and beeswax. Since each bed is made individually, we work with you to adjust the features for your particular needs. . 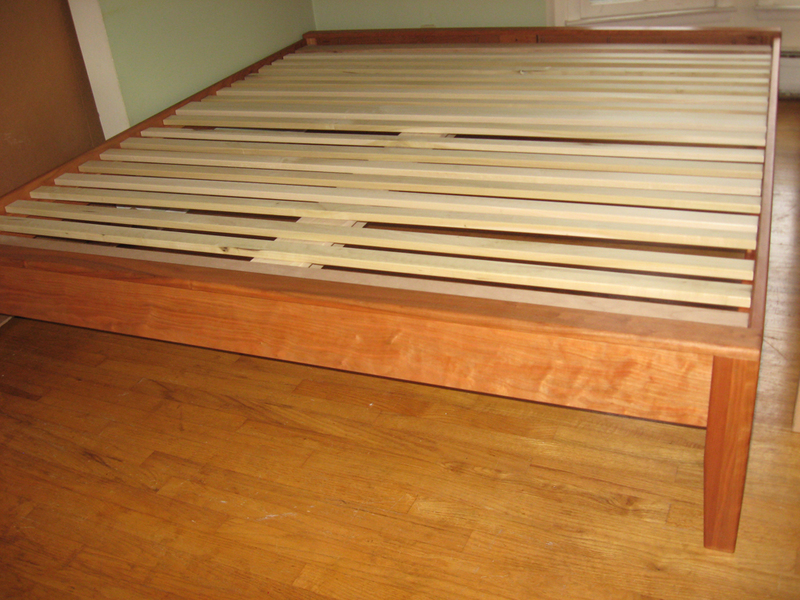 Bed frame can hold a mattress directly on slats, or, if you prefer, a box support or box spring. It makes a perfect foundation for our Green Dreams™ 100% Natural Latex mattress, Green Dreams™ innerspring, or White Lotus futon. 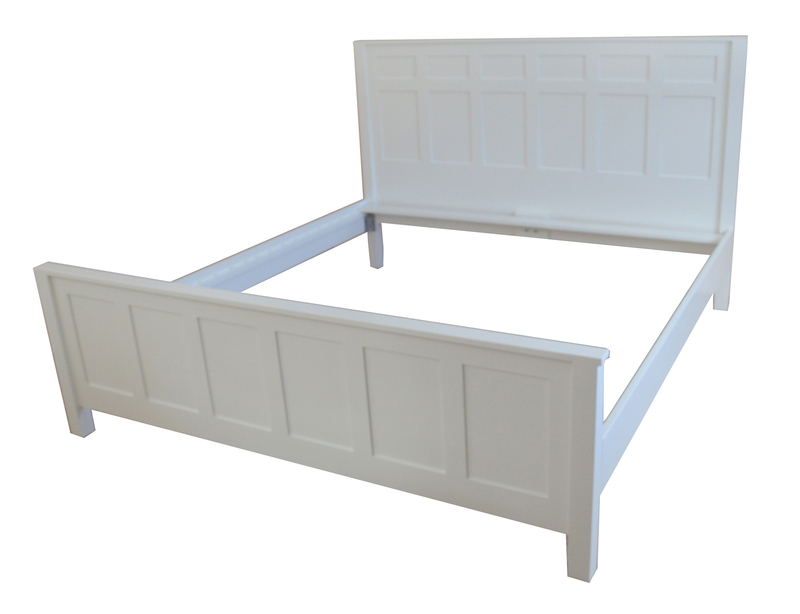 The handsome, romantic Chatham Estates bed frame features multiple Shaker-style, flat panels. 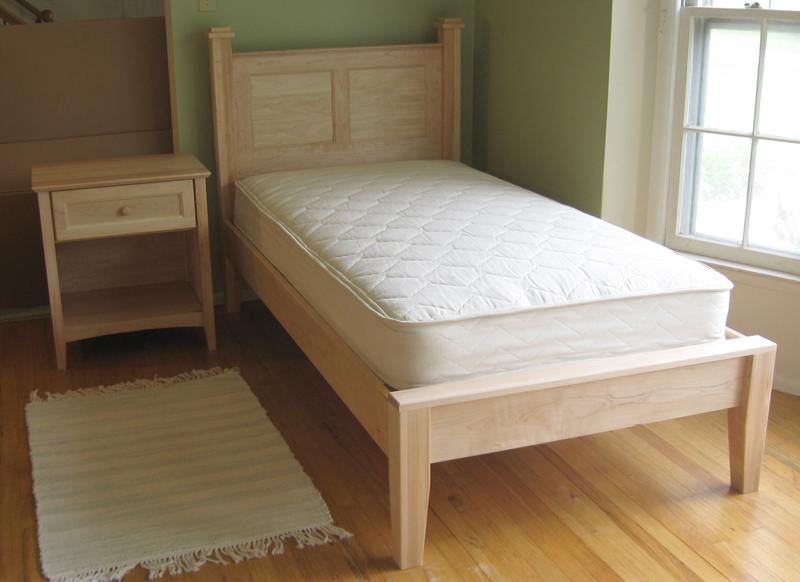 Hand-built by expert Amish craftsmen from kiln-dried, solid maple and finished with zero VOC paint. 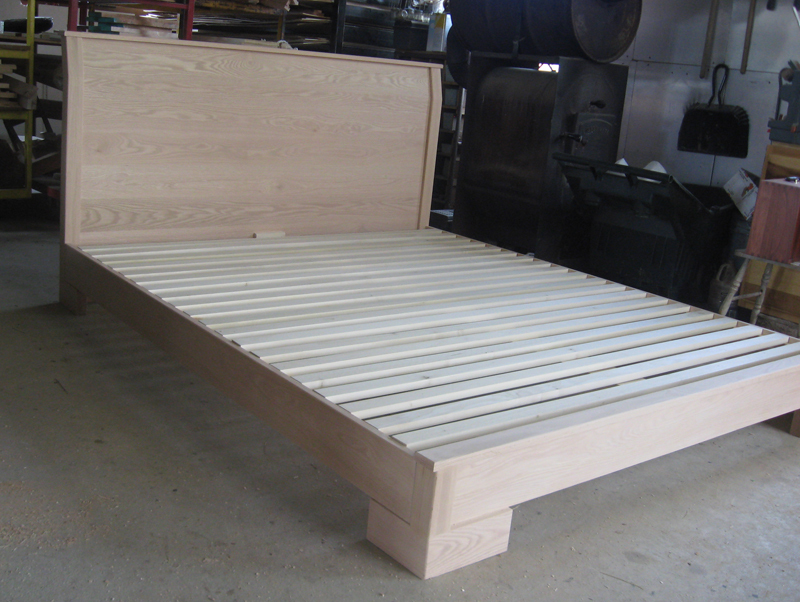 Since each bed is made individually, we work with you to adjust the features of this bed for your particular needs. 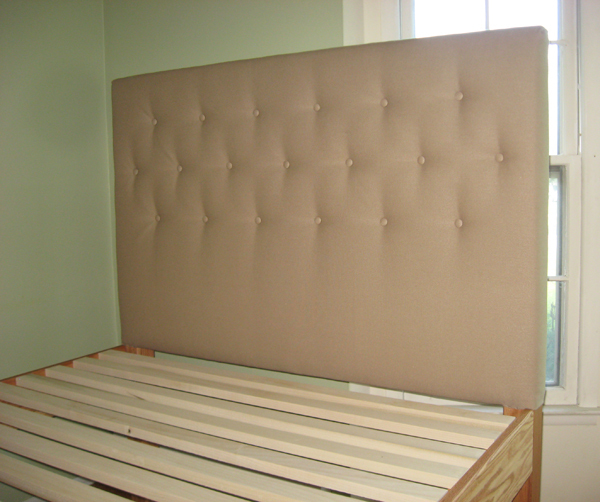 Headboard as pictured is 50" high to the top of the cap. Footboard as pictured is 25" high. 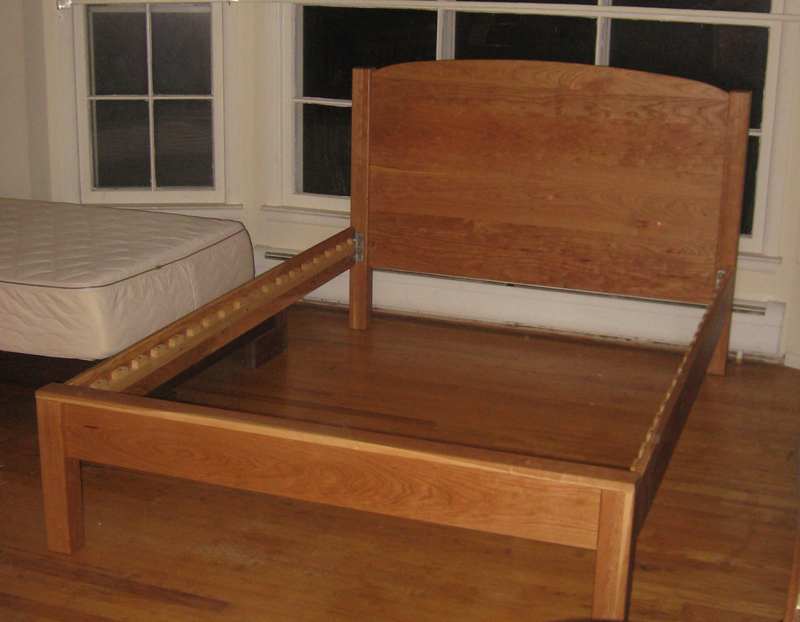 Bed may be built with posts rising above the caps.. Headboard and footboard may be ordered shorter or taller. 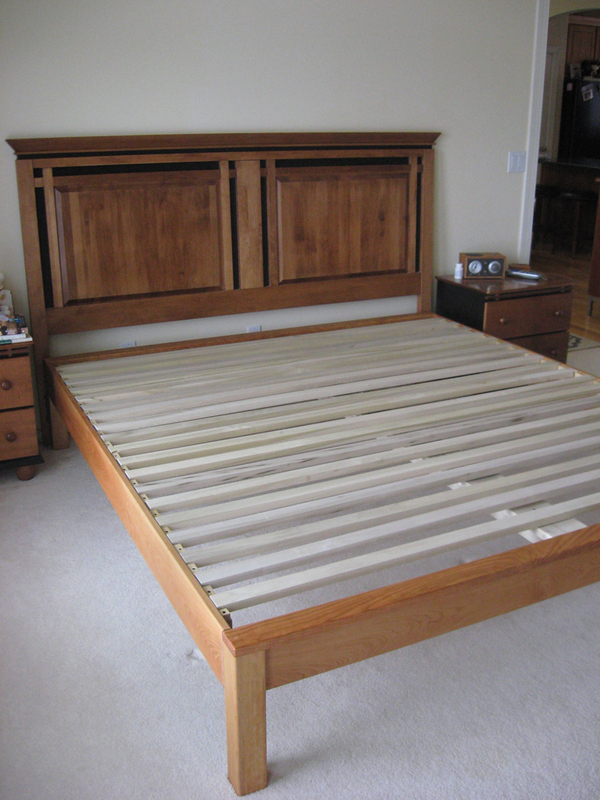 Bed frame can hold a mattress directly on slats or, if you prefer, a box support or box spring. 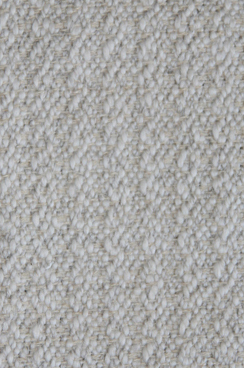 It makes a perfect foundation for our Green Dreams™ 100% Natural Latex mattress or Green Dreams™ innerspring. 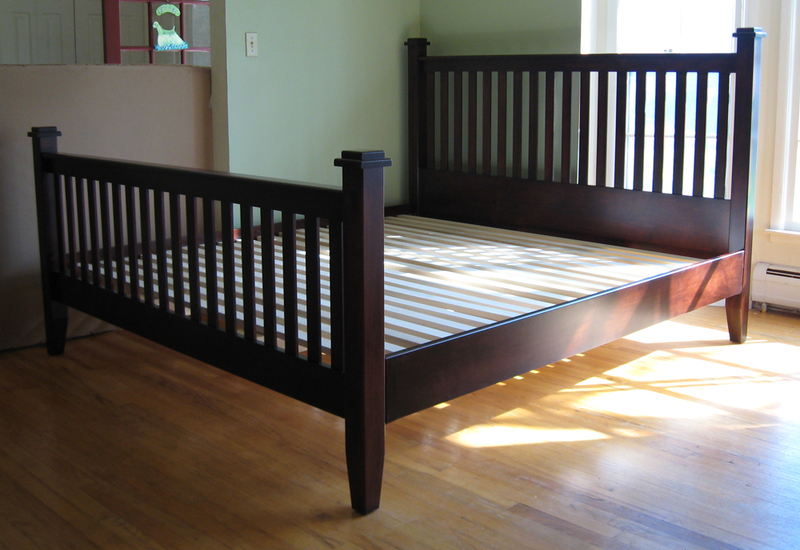 Price of bed frame below includes zero VOC paint color of your choice. Price may vary depending on custom features. Easy assembly. Matching storage bed, night stand, tall chest, dresser, toy chest and armoire available upon request. 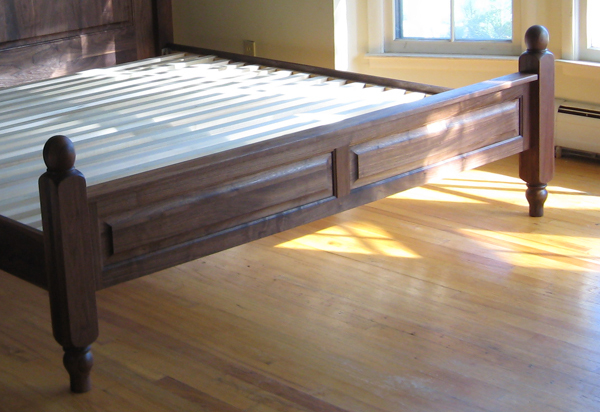 The Emma simple platform bed frame features lovely turned legs. 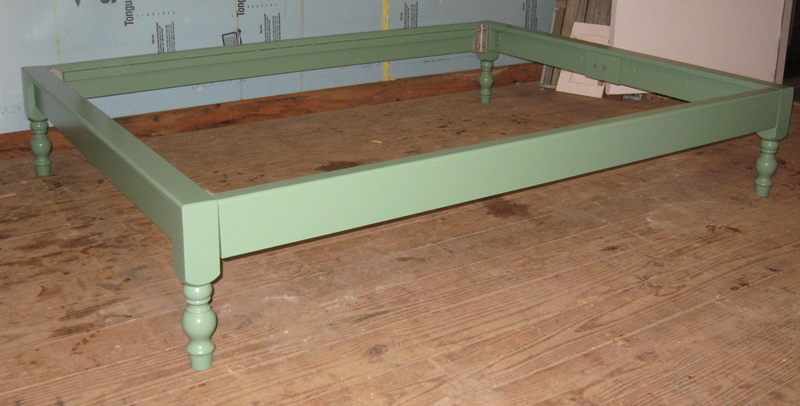 Hand-built by expert Amish craftsmen from kiln-dried, solid maple and painted with zero VOC paint. 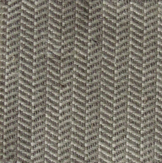 May be ordered with a wooden or upholstered headboard for additional cost. Only nontoxic, water-based glue used as necessary. Easy assembly. 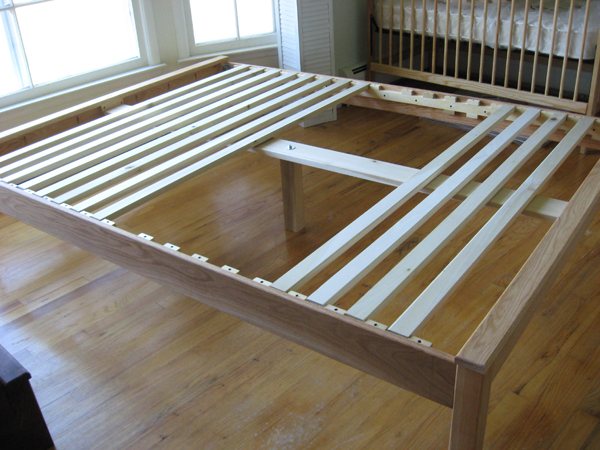 This bed frame is designed to hold a mattress directly on slats. 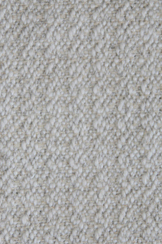 It makes a perfect foundation for our Green Dreams™100% Natural Latex mattress or Green Dreams™ innerspring mattress. 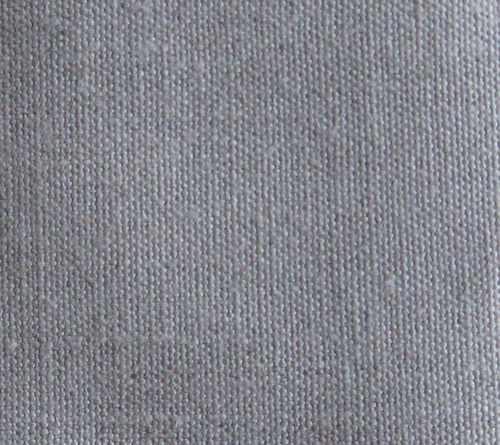 Price of bed frame below includes finish with your color choice of zero VOCÂ paint. 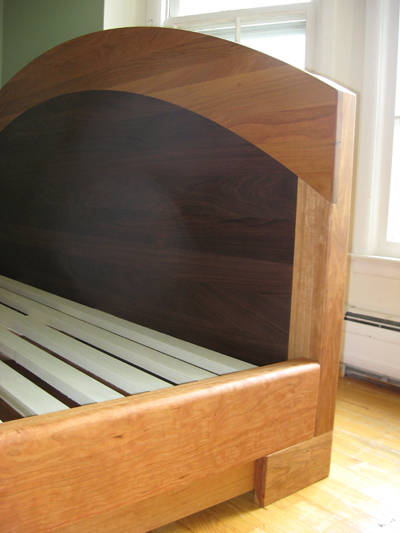 Bed also may be ordered in solid wood finished with our all-natura, nontoxic linseed/tung oil and beeswas product. Wood choices: Oak, ash, hard maple,cherry, walnut, and hickory. (Request pricing.) Matching night stand, chest, and dresser available upon request. Inspired by the traditional Asian style, this low-profile bed is beautiful in its simplicity, with a distinctive bend on the headboard, minimal footboard and block feet. Hand-built by expert Amish craftsmen from kiln-dried, solid wood. The walnut is a rich, darker wood with gorgeous color and character. 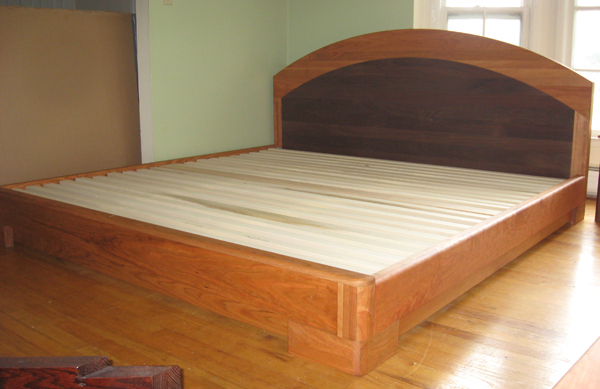 Since each bed is made individually, we work with you to adjust the features of this bed for your particular needs. The headboard may be ordered up to 26" high for the price listed below. Headboards higher than 26" are an additional cost. Only nontoxic, water-based glue used as necessary. Easy assembly. 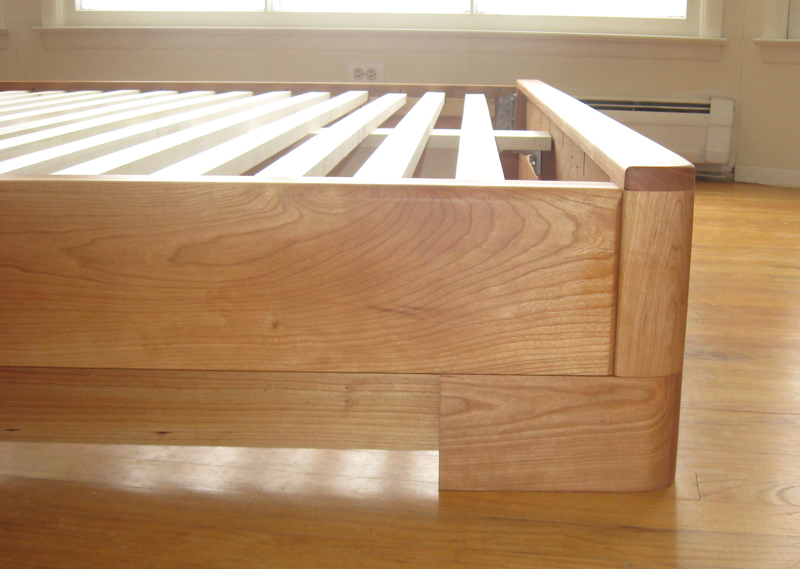 Price of bed frame below includes finish with your choice of our all-natural, nontoxic linseed/tung oil product or bees wax product. Matching night stand, chest, dresser and armoire available upon request. Inspired by the traditional Asian style, this low-profile bed is beautiful in its simplicity, with a distinctive bend on the headboard, minimal footboard and block feet. 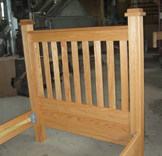 Hand-built by expert Amish craftsmen from kiln-dried, solid cherry. 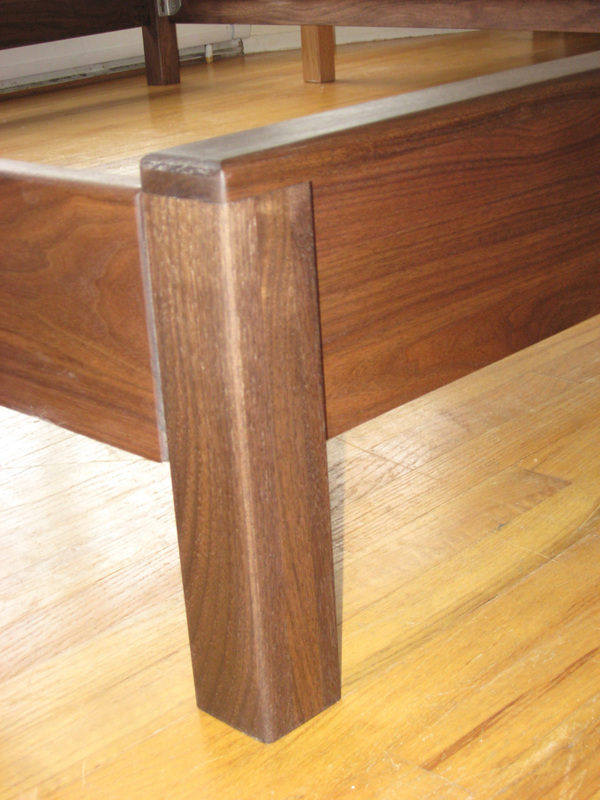 Cherry is a beautiful wood that naturally darkens over time to richer, deeper colors. 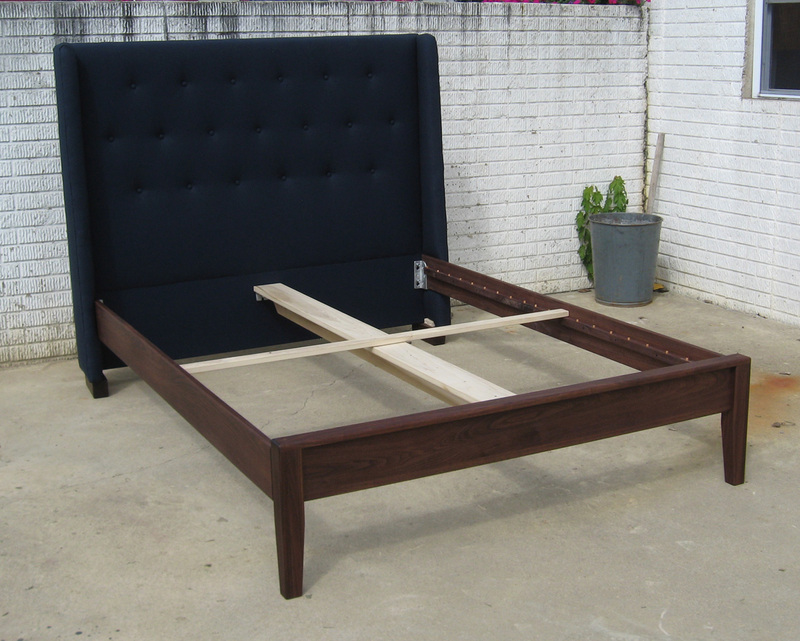 Since each bed is made individually, we work with you to adjust the features of this bed for your particular needs. The headboard may be ordered up to 26" high for the price listed below. 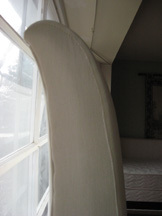 Headboards higher than 26" are an additional cost. Only nontoxic, water-based glue used as necessary. Easy assembly. Inspired by the traditional Asian style, this low-profile bed is beautiful in its simplicity, with a distinctive bend in the headboard, minimal footboard, and block feet. Hand-built by expert Amish craftsmen from kiln-dried, solid oak. 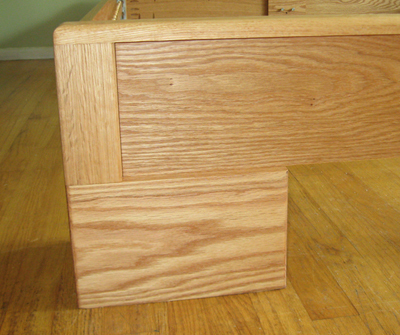 Oak is a traditional wood with a honey color and distinctive grain when finished. 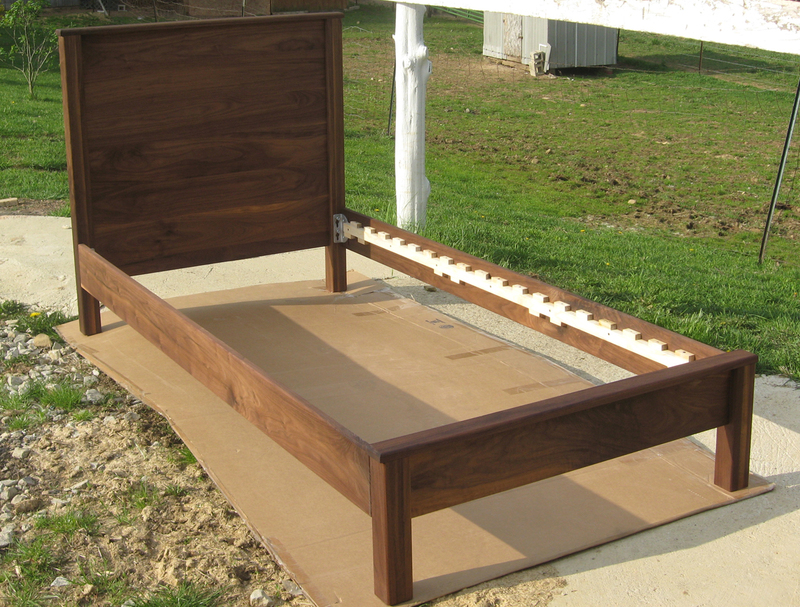 Since each bed is made individually, we work with you to adjust the features of this bed for your particular needs. 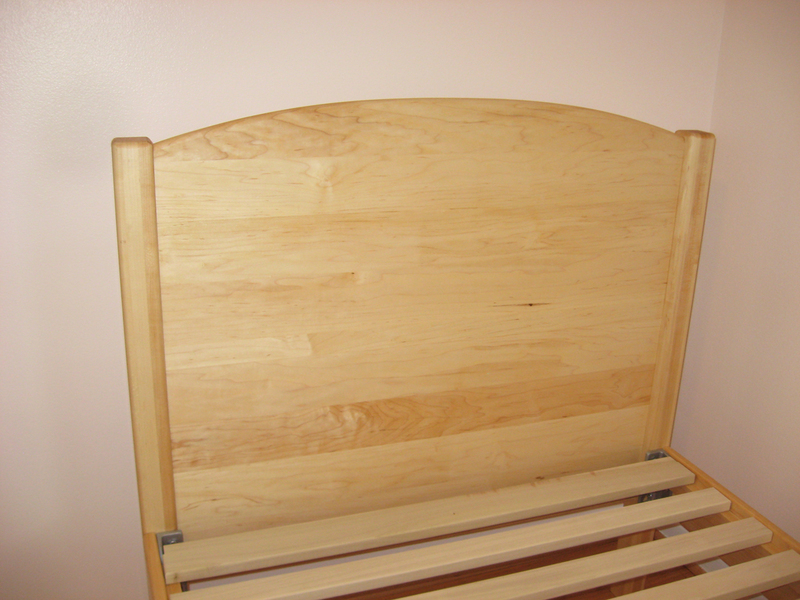 The headboard may be ordered up to 26" for the price listed below. Headboards higher than 26" are an additional cost. Only nontoxic, water-based glue is used as necessary. Easy assembly. 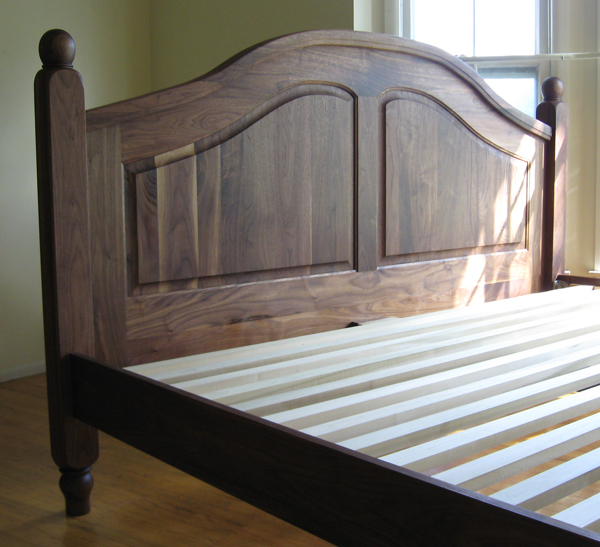 Price of bed frame below includes your choice of finish with our all-natural, nontoxic linseed/tung oil product or bees wax product. Matching night stand, chest, dresser, and armoire are available upon request. 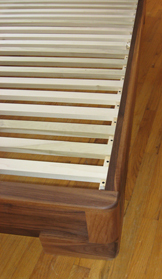 This variation on our Asian-style bed frame was designed by two very talented automotive designers for their own use and custom-made from solid wood by an Amish artisan. It came out so well, we wanted to offer it to everyone. 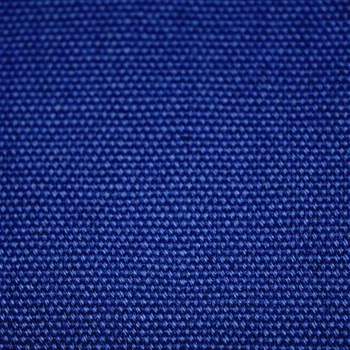 Note the beautiful rounded corners and other rounded edges. 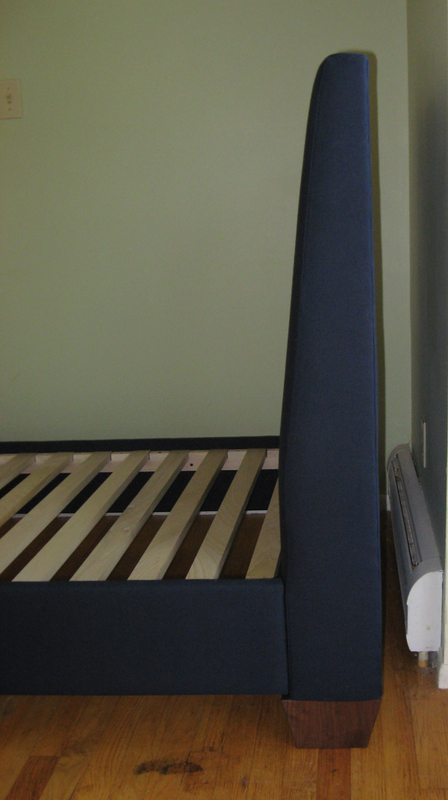 The side rails are double-thick with a laminated look, with wider legs on the headboard and footboard to accomodate the wider side rails. The headboard has a 4" shelf. They even added paneling almost to the floor to help keep their cats from going under the bed! Since each bed frame is made individually, we are able to adjust some of the features of this design for your particular needs. Headboard height on this bed frame is 33" as pictured, but may be ordered higher or lower. Shelf and "cat panels" are optional.Queen and king come with a center support. Only nontoxic,water-based glue used when necessary. Easy assembly. 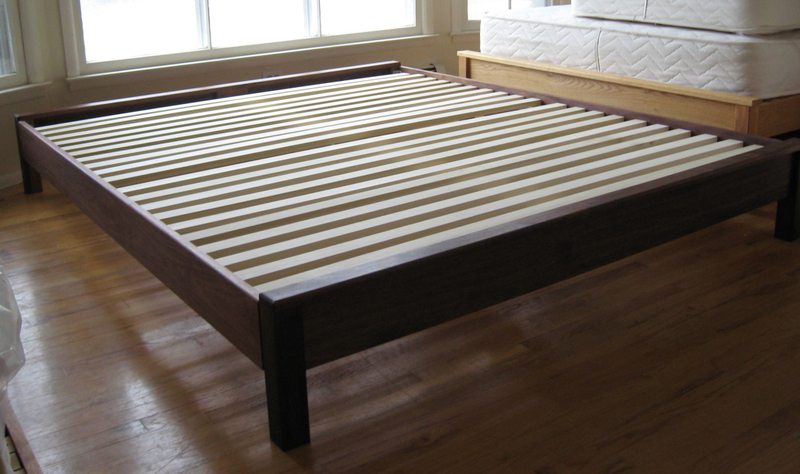 Price of bed frame below includes finish with your choice of our all-natural, nontoxic linseed/tung oil or bees wax products. The price of this bed frame is dependent on the various custom details. Matching night stand, chest, dresser and armoire available upon request. This beautiful variation on our Asian-style bed frame features rounded corners on the headboard and footboard and double-thick side rails with rounded edges. Note how the headboard is straight instead of having a bend. Paneling closes the bed off almost to the floor. Hand-built by expert Amish craftsmen from kiln-dried, solid wood. Pictured in cherry, a beautiful wood that naturally darkens over time to richer, deeper colors. 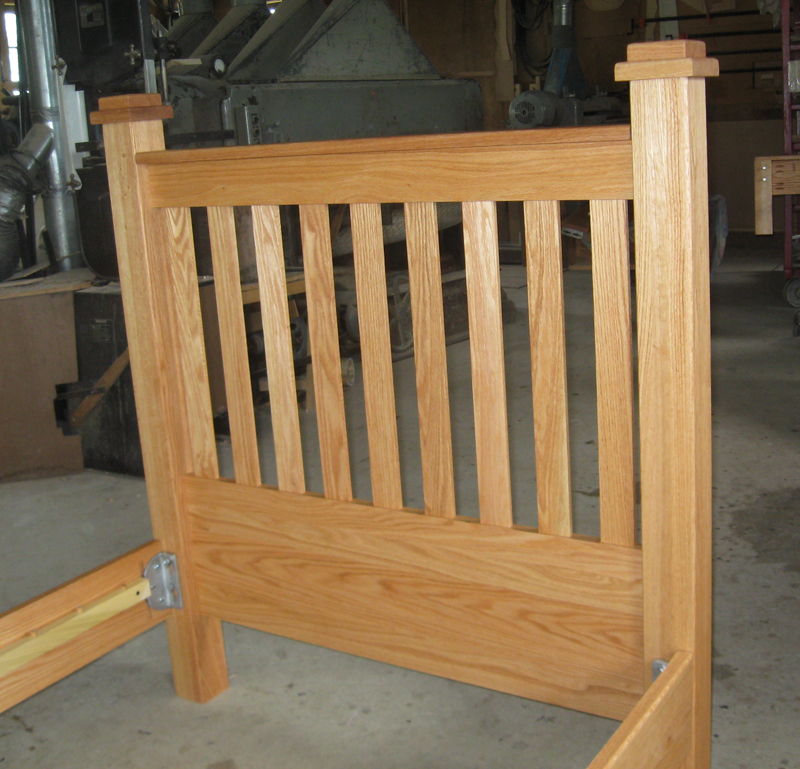 Since each bed frame is made individually, we work with you to adjust the features of this bed for your particular needs. 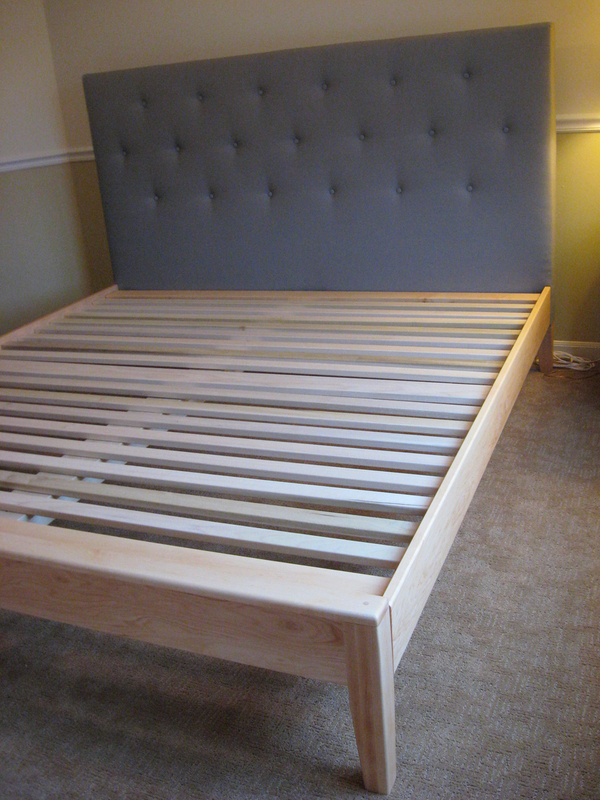 Headboard height on this bed frame is 35" as pictured, but may be ordered higher or lower. The paneling may be left off. Queen and king come with a center support. Only nontoxic glue is used when necessary. Easy assembly. 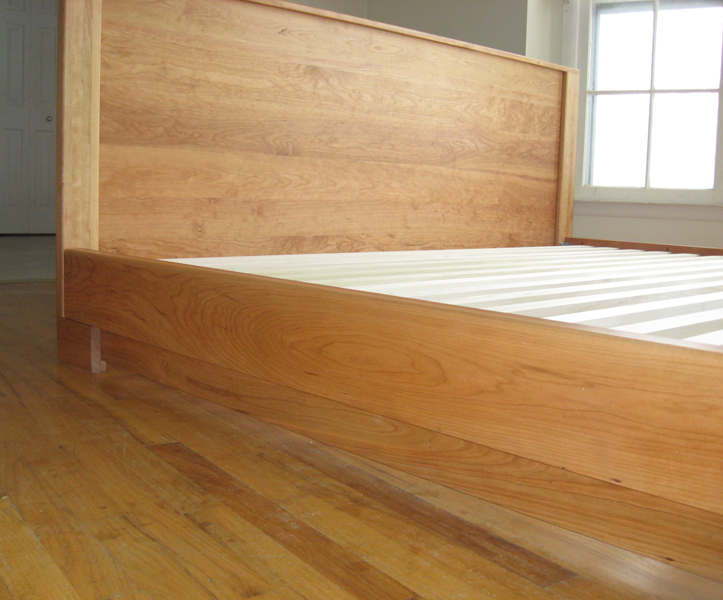 Price of bed frame below includes finish with your choice of our all-natural, nontoxic linseed/tung oil product or bees wax product. 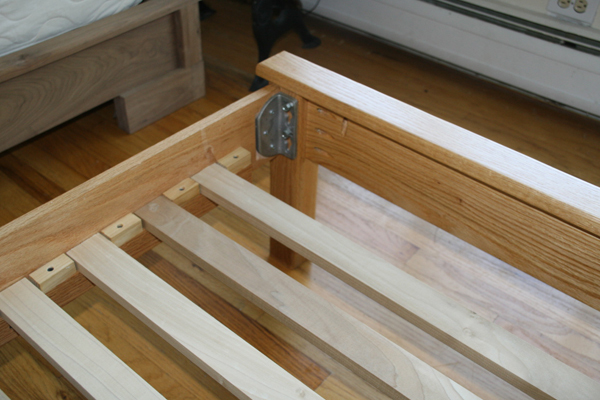 The price of this bed frame is dependent on the custom details. Matching night stand, chest, dresser and armoire are available upon request. This gorgeous Asian-style bed frame with tapered block feet and slanted headboard is hand-built in the U.S. by expert Amish craftsmen from solid, kiln-dried wood. No plywood, MDF board or laminate used. Only nontoxic, water-based glue used as necessary. 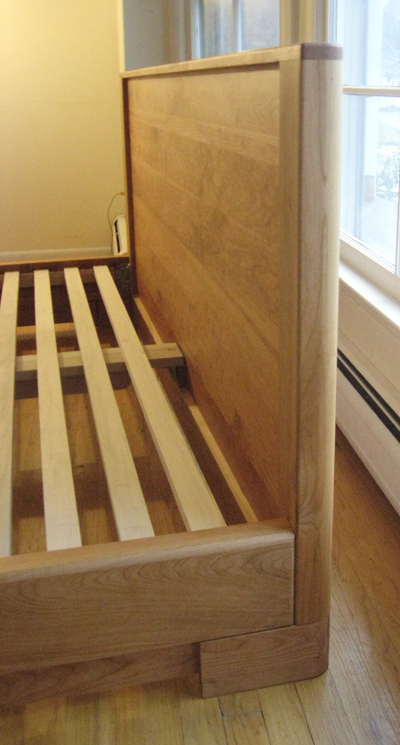 The slanted headboard is 36 1/2" high from the floor and 25" high above the slats. 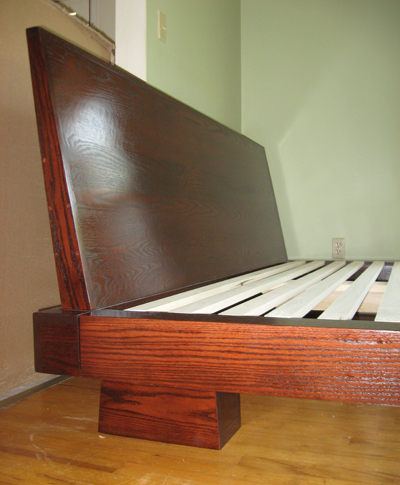 First bed pictured was made from solid oak stained with conventional Rich Cherry stain with a high gloss topcoat. Balance may also be ordered in oak with no stain, maple, cherry, or walnut finished with your choice of our nontoxic finishes. 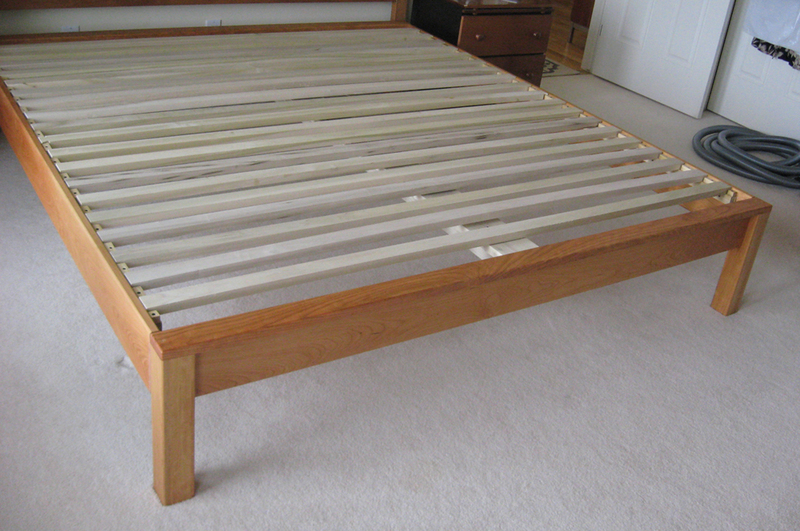 Bed frame holds mattress directly on slats. It makes a perfect foundation for our Green Dreams™100% Natural Latex mattress, Green Dreams™ innerspring, or White Lotus futon. Save when purchasing a mattress with bed frame. (Request pricing.) Easy assembly. Price of bed frame below includes finish with your choice of our all-natural, nontoxic linseed/tung oil product or bees wax product. 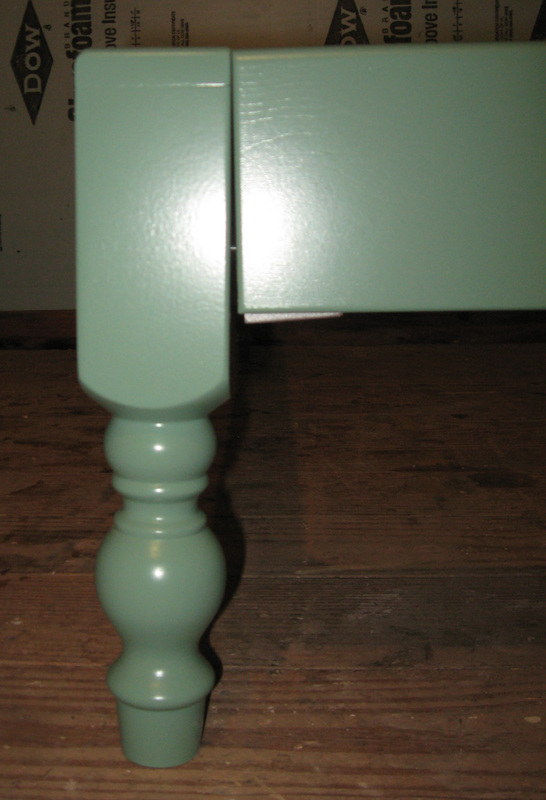 Additional charge for finish with conventional stain and glossy topcoat as pictured. Matching nightstands, chest, dresser, and armoire available upon request. 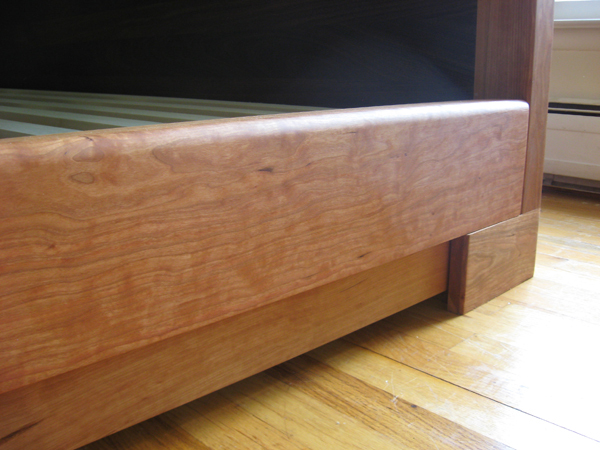 The Simple Asian-style bed design offers the signature block feet, but no headboard. 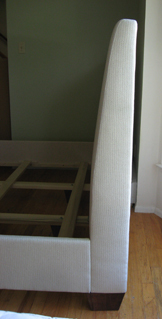 (Headboard and footboard are the same.) Hand-built by expert Amish craftsmen from kiln-dried, solid oak. Only nontoxic glue is used as necessary. Oak is a traditional wood with a honey color and distinctive grain when finished. 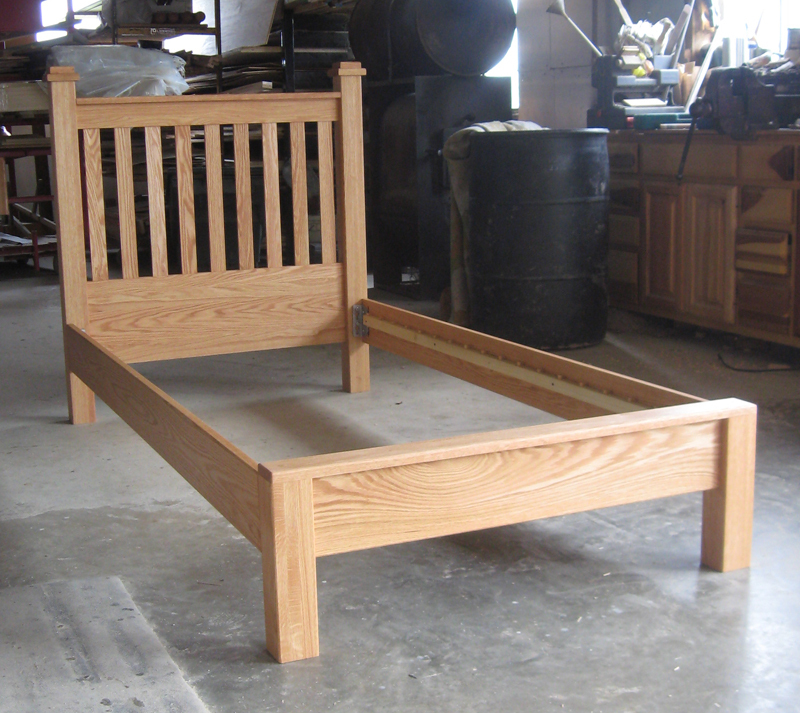 Since each bed is made individually, we work with you to adjust the features of this bed for your particular needs. Easy assembly. 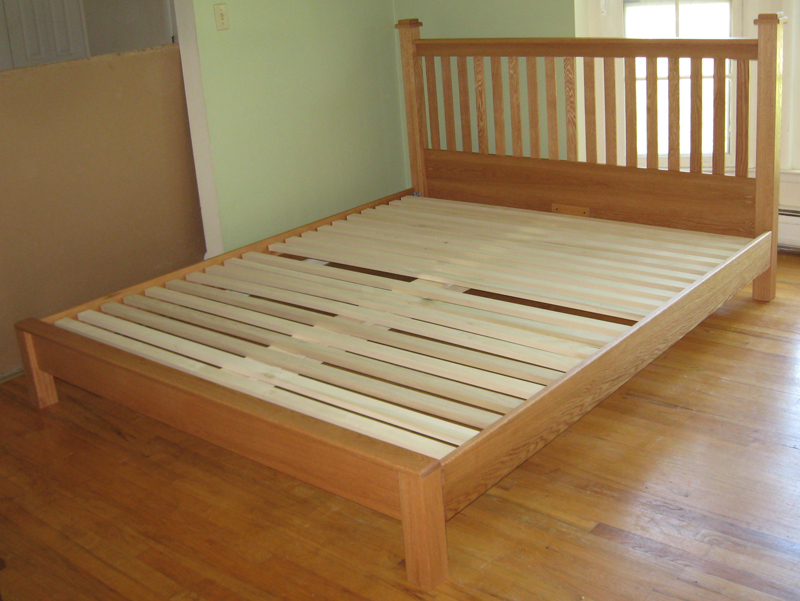 Bed frame can hold a mattress directly on slats or, if you prefer, a box support or box spring. 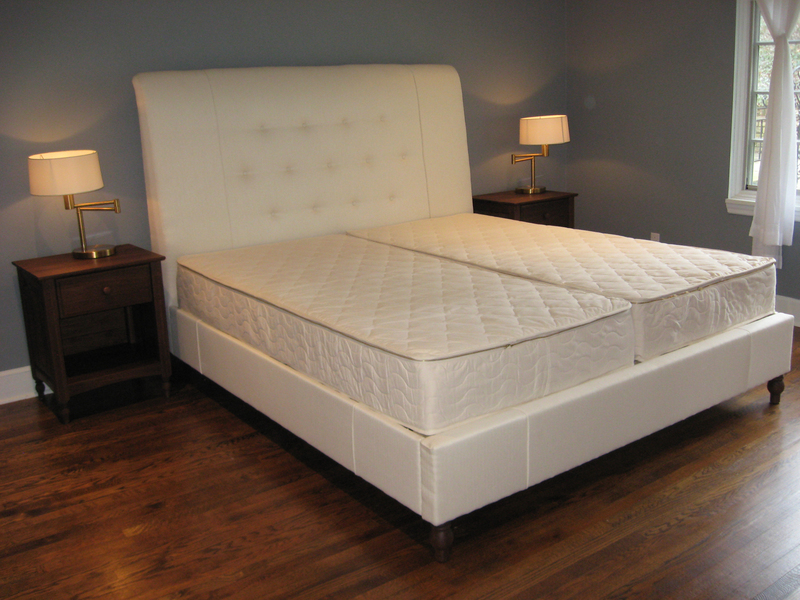 It makes a perfect foundation for our Green Dreams™ 100% Natural Latex mattress and Green Dreams™ innerspring. Price of bed frame below includes finish with our all-natural, nontoxic linseed/tung oil and beeswas product. 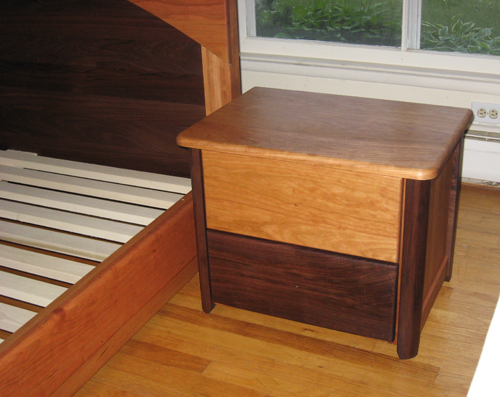 Matching night stand, chest of drawers, dresser, and armoire are available upon request. This gorgeous Rainbow headboard was the implementation of a customer's design idea. The headboard may have two or three woods making the bow. 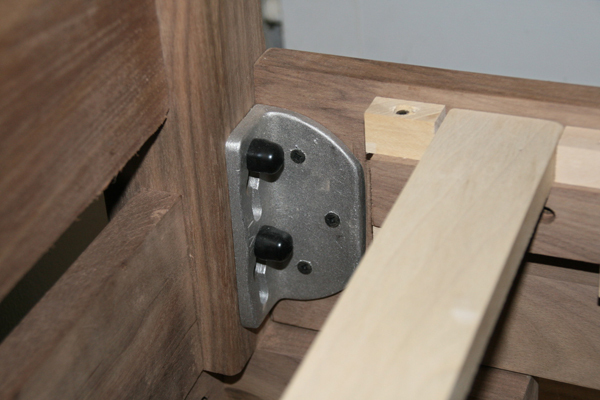 The footboard has rounded corners. 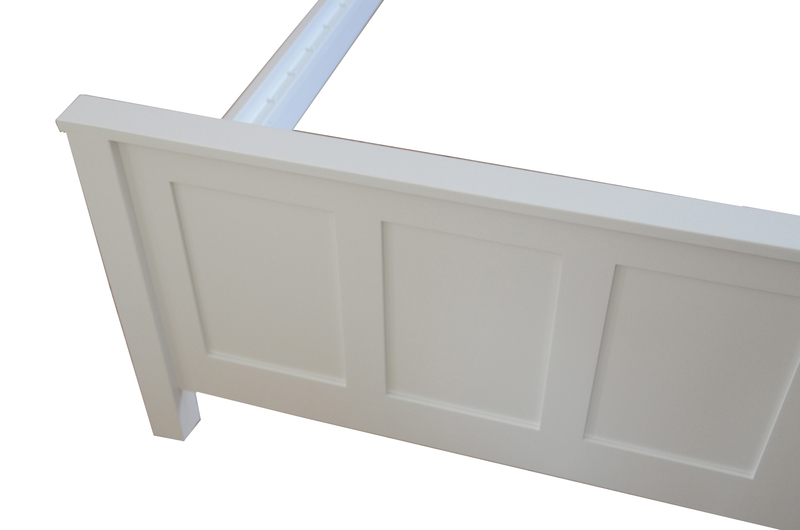 The side rails are double-thick with rounded outside edges. 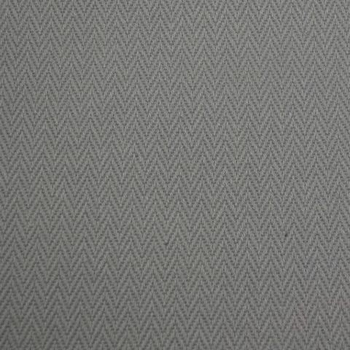 Optional paneling closes the bed off almost to the floor. Hand-built by expert Amish craftsmen from kiln-dried, solid wood.Only nontoxic, water-based glue is used as necessary. 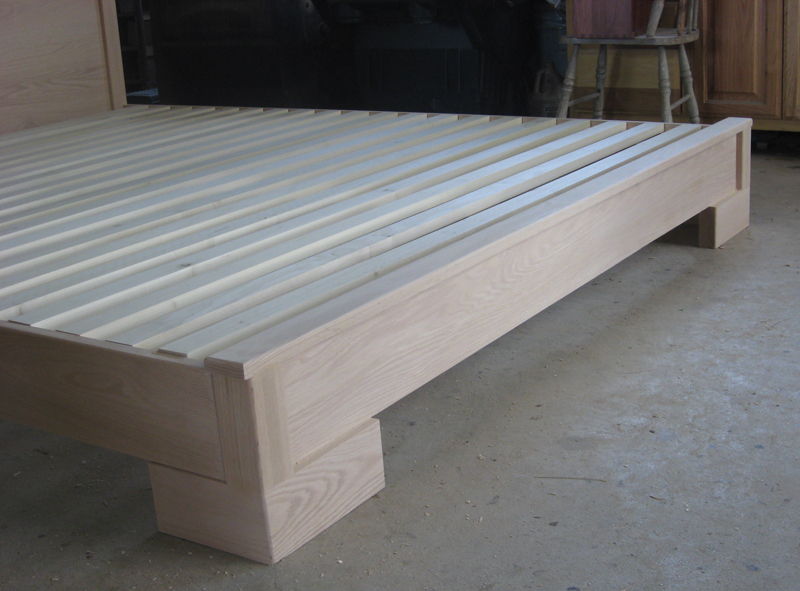 Since each bed frame is made individually, we work with you to adjust the features of this bed for your particular needs.Headboard height on the bed pictured is 42" from floor to the top of the bow. Queen and king come with a center support.Easy assembly. 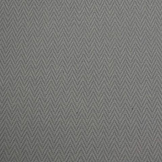 Prices listed below are for 42" headboard with details as pictured. 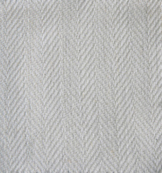 Price includes finish with your choice of our all-natural, nontoxic linseed/tung oil product and/or bees wax product. Prices will vary depending on custom details. 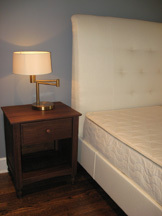 Matching night stand, tall chest, dresser and armoire are available upon request. The Stockton solid-wood bed frame captures the classic simple lines and functionality that Mission-style furniture represents. Hand-built by expert Amish craftsmen from kiln-dried, solid wood. 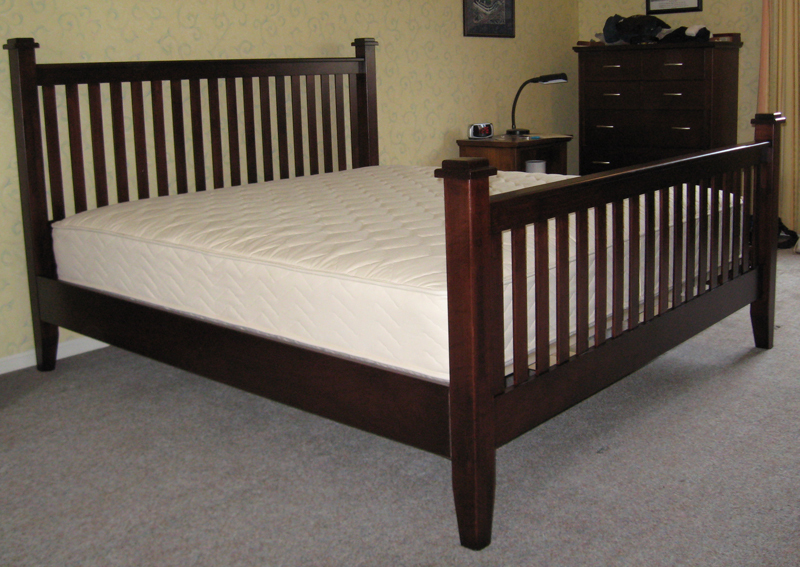 Since each bed is made individually, we work with you to adjust the features of this bed for your particular needs. 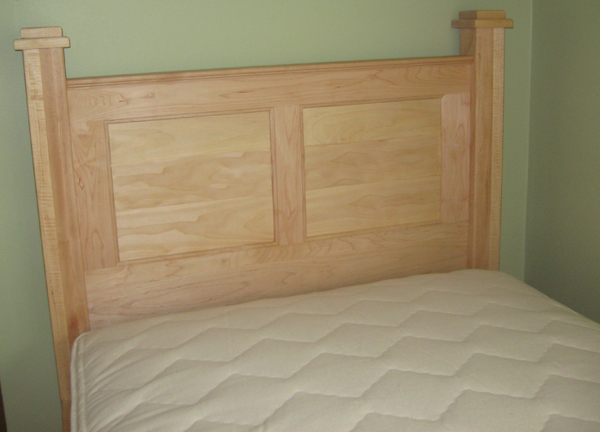 Headboard as pictured is 42" high to the top of the cap and 46" to the top of the posts. Headboard may be ordered shorter or taller. 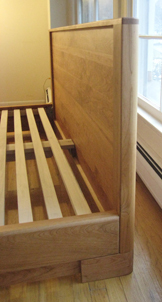 Footboard may be ordered with Mission slats for an additional charge. Easy assembly. 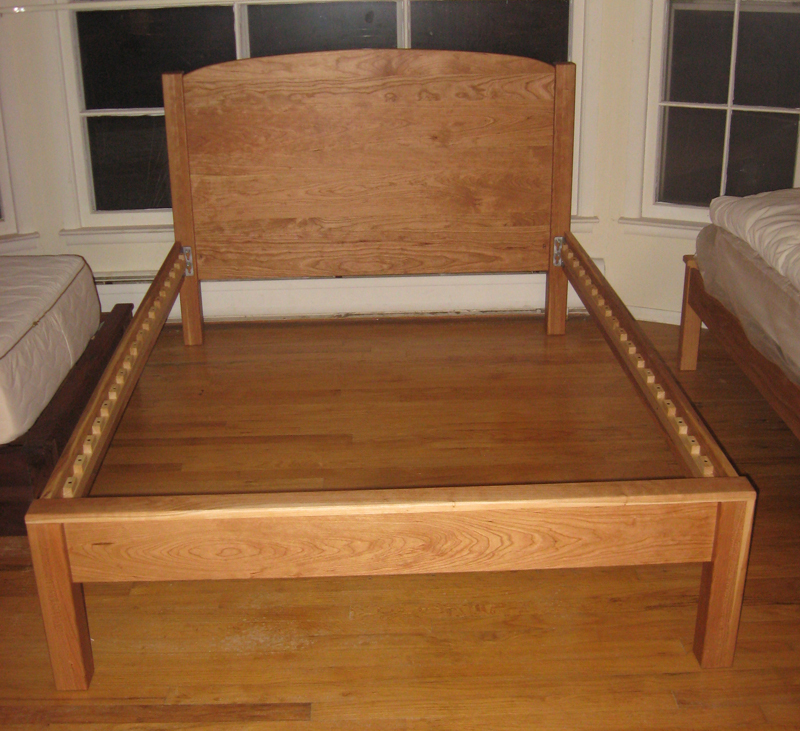 Price of bed frame below includes finish with your choice of our all-natural linseed/tung oil product or bees wax product. Price may vary depending on custom features. Matching night stand, chest, dresser and armoire available upon request. 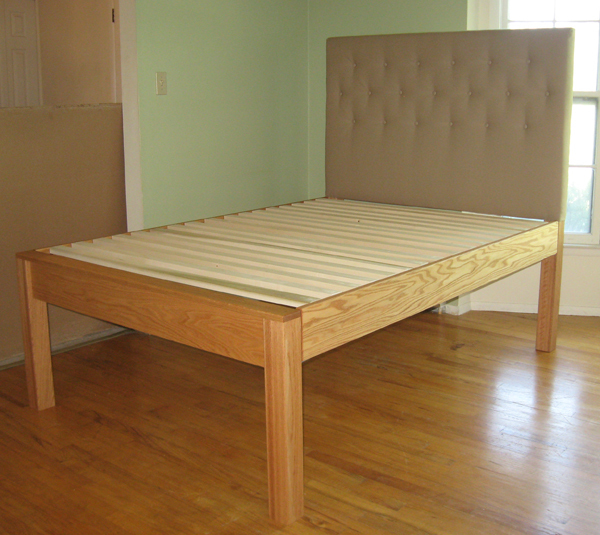 Bed frame can hold a mattress directly on slats or, if you prefer, a box support or box spring. It makes a perfect foundation for our Green Dreams™ 100% Natural Latex mattress, Green Dreams™ innerspring, or White Lotus futon-style mattress. 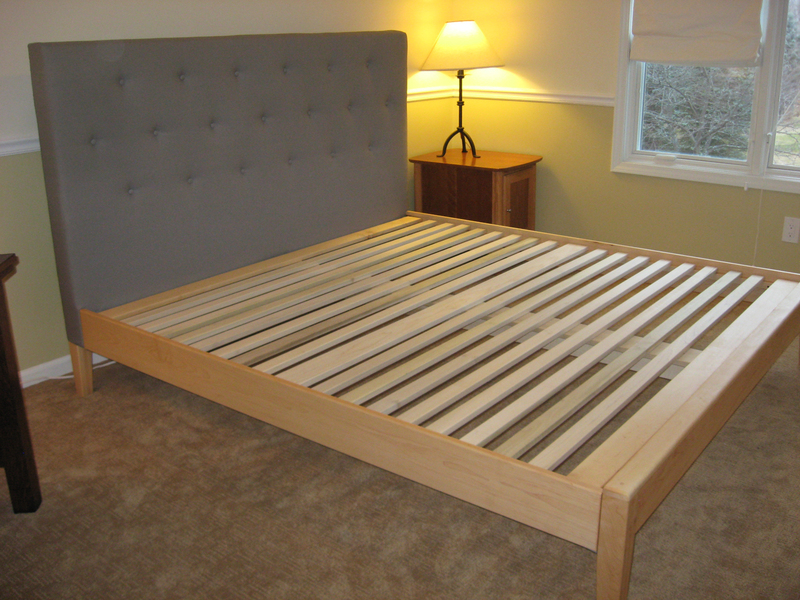 Save when purchasing a mattress with bed frame. (Request pricing.) 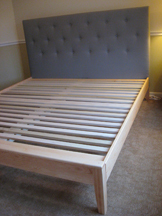 Bed frame is easy to assemble. 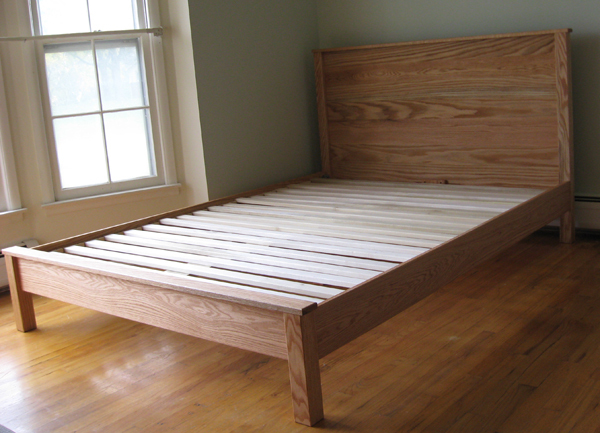 Price of bed frame below includes finish with your choice of our all-natural linseed/tung oil product or bees wax product. Additional charge for stain and topcoat as pictured. Price of be frame may vary depending on custom features. Matching night stand, chest, dresser and armoire available upon request. The Madison bed frame is both handsome and romantic. The headboard features substantial posts, flat panels, frames with stylized edges, and cap dressed up just right with detailing. Legs are tapered. Hand-built by expert Amish craftsmen from kiln-dried, solid wood. 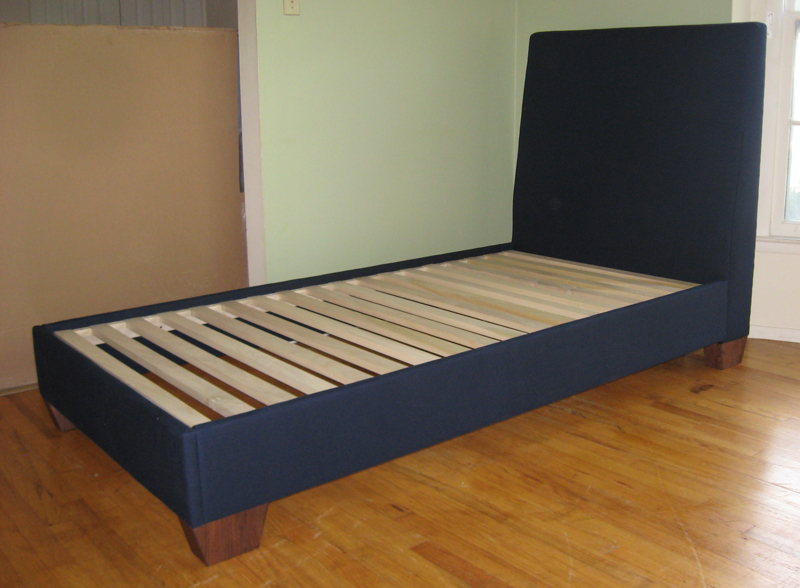 Since each bed is made individually, we work with you to adjust the features of this bed for your particular needs. Headboard as pictured is 42" high to the top of the cap and 46" to the top of the posts. 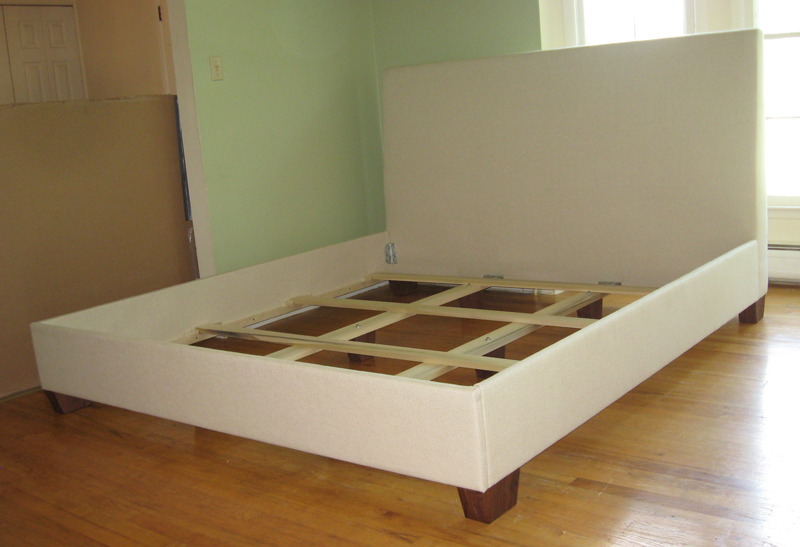 Headboard may be ordered shorter or taller. 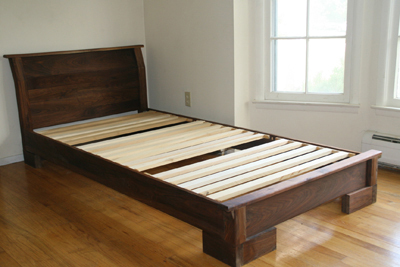 Bed may be ordered with footboard style to match headboard (additional charge). 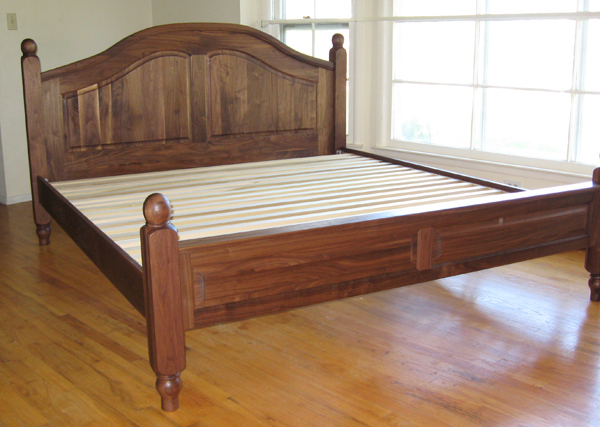 Price of bed frame below includes finish with your choice of our all-natural linseed/tung oil product or bees wax product. Price may vary depending on custom features. Easy assembly. 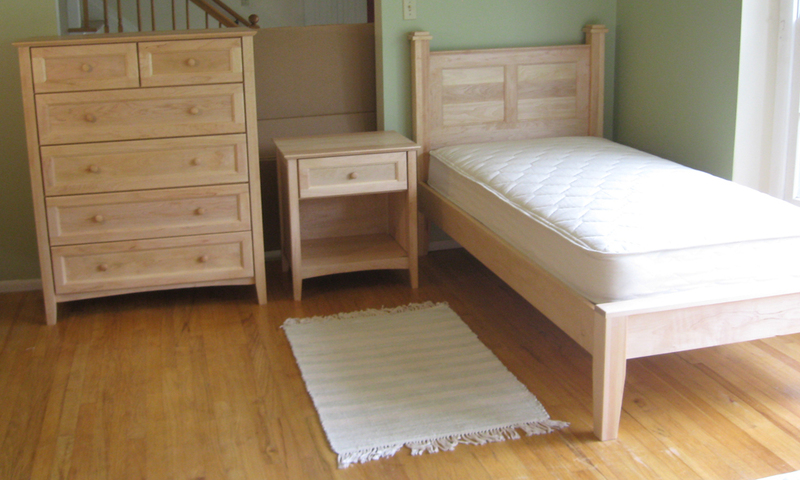 Matching storage bed, night stand, tall chest, dresser, toy chest and armoire available upon request. 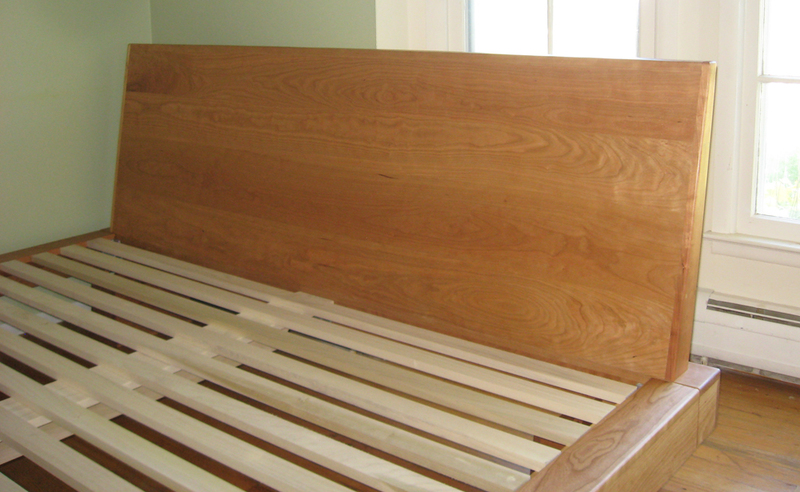 This bed provides the appeal of simplicity, with a straight-lined headboard that features the grain of the wood.. Hand-built by expert Amish craftsmen from solid, kiln-dried, solid wood. 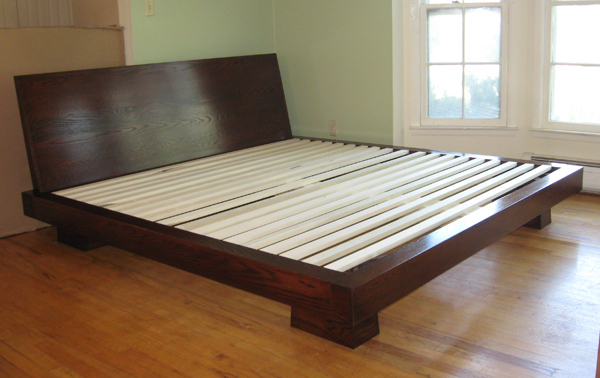 Since each bed is made individually, we work with you to adjust the features of this bed for your particular needs. 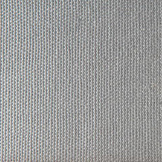 Headboard as pictured is 42" high, but may be ordered shorter or taller. From floor to the bottom of side rails is 7" as pictured. Easy assembly. Price includes finish with your choice of our all-natural linseed/tung oil product or bees wax product. Price may vary depending on custom features. Matching night stand, chest, dresser and armoire available upon request. 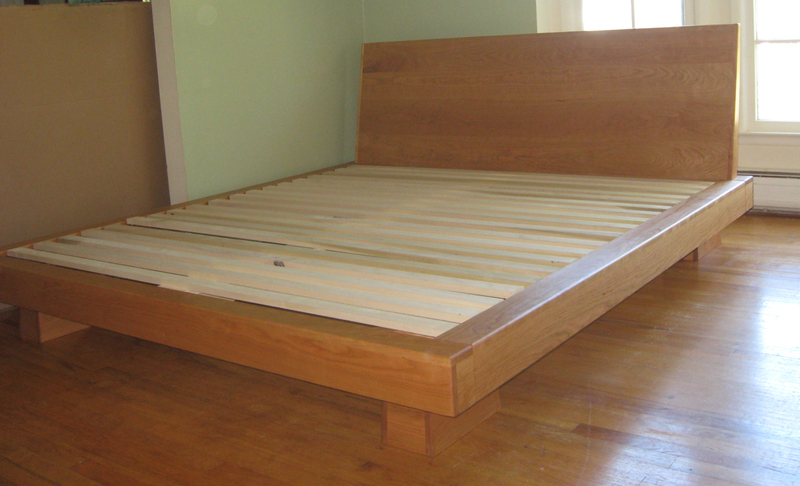 Bed frame can hold a mattress directly on slats, or, if you prefer, box support or box spring. 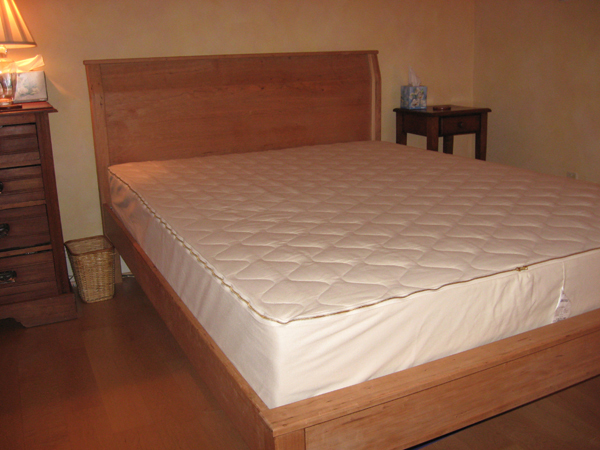 It makes a perfect foundation for our Green Dreams™ 100% Natural Latex mattress or Green Dreams™ innerspring mattress. 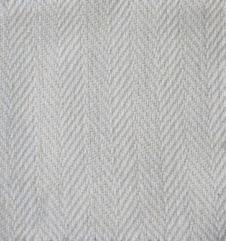 Price includes finish with oil and beeswax. Price may vary depending on custom features. Matching night stand, chest, dresser and armoire available upon request. 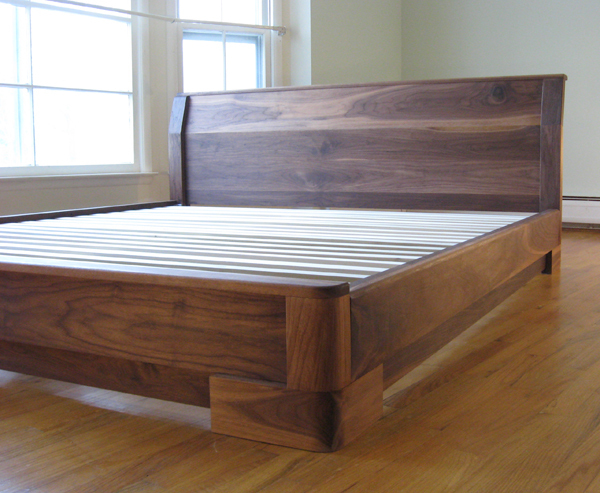 This gorgeous, raised panel bed frame was custom-made from solid walnut by an Amish artisan for one of our customers. We liked it so much that we wanted to offer it to everyone else. 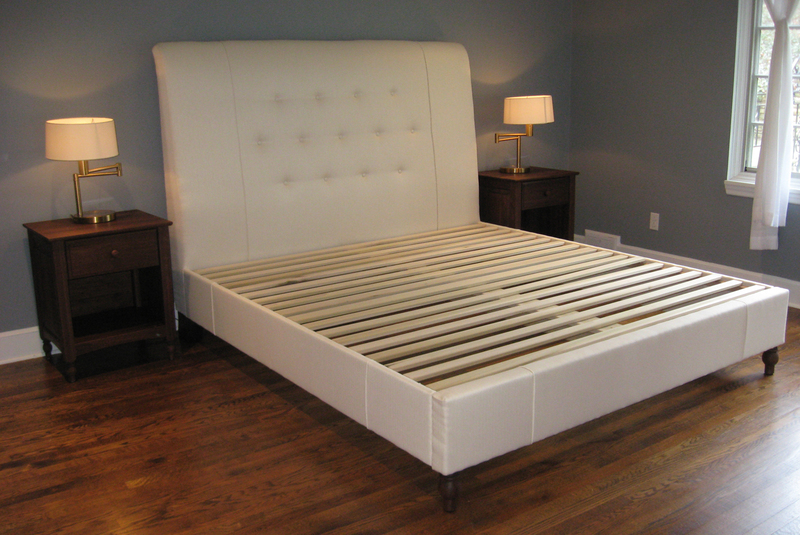 Since each bed is made individually, we work with you to adjust the features of this bed for your particular needs. Queen and king come with center support. Only nontoxic, water-based glue is used when necessary. Easy assembly. 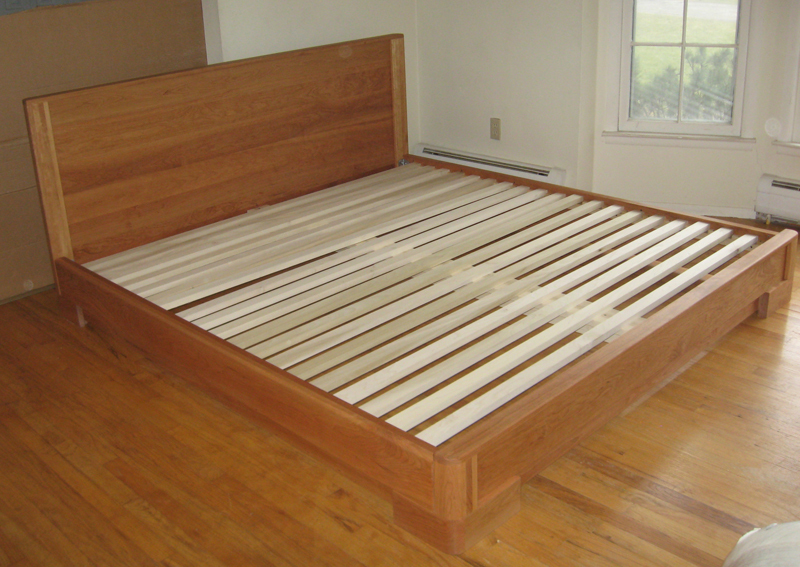 This simple bed provides a more economical choice for owning a quality, solid-wood bed frame. 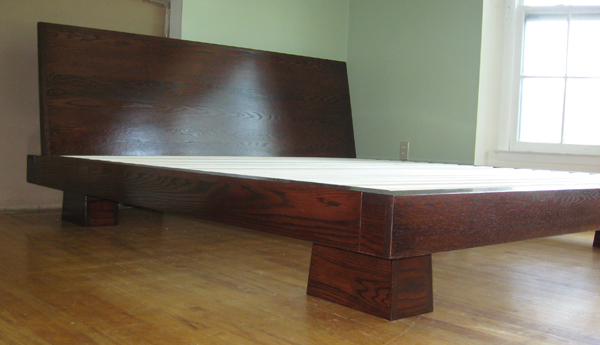 We can even build one that works with a headboard you already have. Hand-built by expert Amish craftsmen from kiln-dried, solid wood. Since each bed is individually made, we are able to adjust some of the features of this bed for your particular needs. Easy assembly. Sturdy construction provides an excellent foundation for a Green Dreams™ 100 % Natural Latex mattress or Green Dreams™ innerspring mattress. 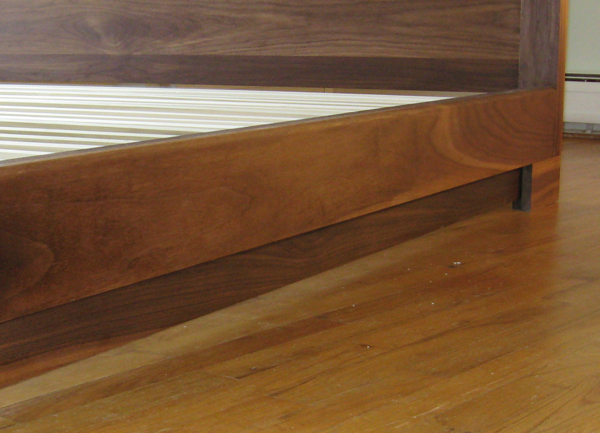 Bed is built to hold a mattress directly on slats. 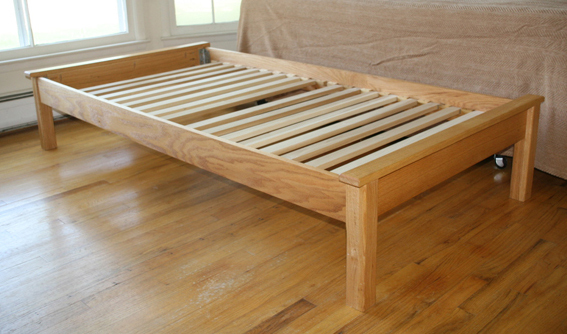 Price of bed frame below includes finish with our all-natural, nontoxic linseed/tung oil and bees wax product. Price may vary depending on custom features. 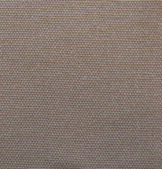 Available in Regular Profile (up to 10" legs) and High Profile. Matching night stand, chest, dresser and armoire available upon request. 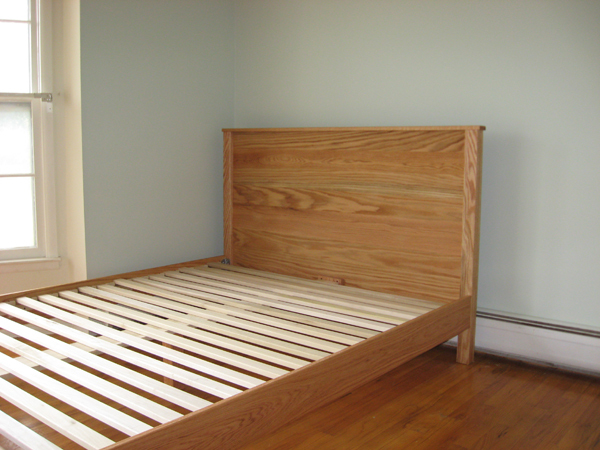 This simple bed provides a more economical choice for owning a quality, solid-wood bed frame.We can even build one that works with a headboard you already have. Hand-built by expert Amish craftsmen from kiln-dried, solid wood. Since each bed is individually made, we are able to adjust some of the features of the design for your particular needs. Easy assembly. 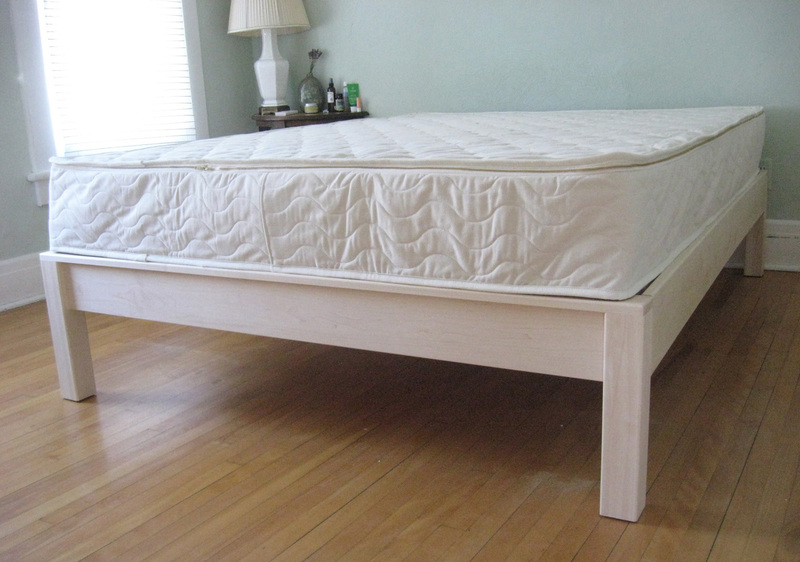 Sturdy construction provides an excellent foundation for any one of our Green Dreams™ 100% Natural Latex mattress or Green Dreams™ Innerspring mattress.Bed frame is built to hold hold mattress directly on slats. 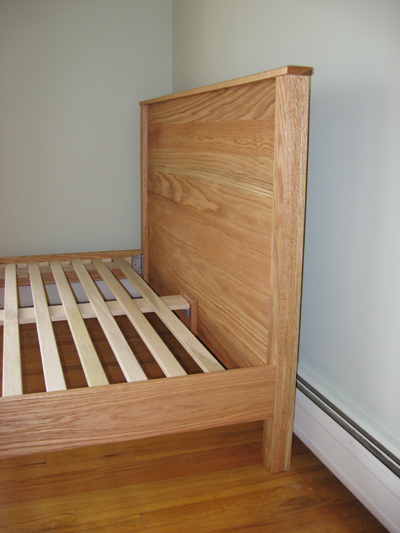 Price of bed frame below includes finish with our all-natural, nontoxic linseed/tung oil and beeswax product. Price may vary depending on custom features. Available in Regular Profile (up to 10" legs) and High Profile. Matching night stand, chest, dresser and armoire available upon request. Sturdy construction provides an excellent foundation for any one of our Green Dreams™ 100% Natural Latex mattress or Green Dreams™ Innerspring mattress. 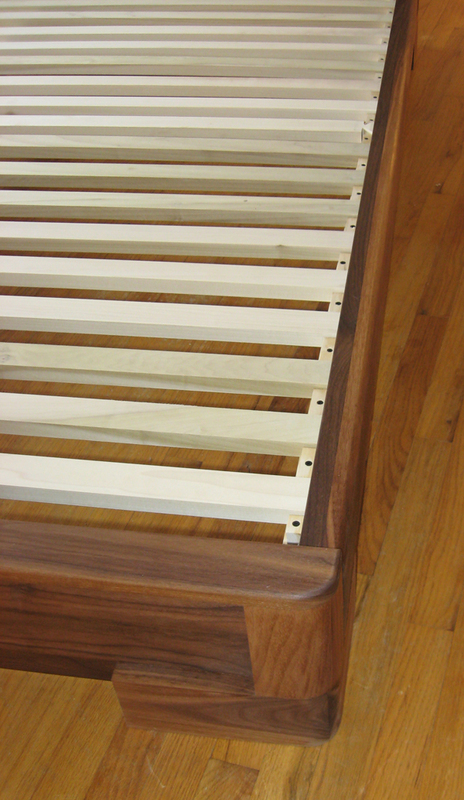 Bed frame is built to hold hold mattress directly on slats. Price of bed frame below includes finish with allnatural, nontoxic tung/linseed oil and beeswax product. Price may vary depending on custom features. 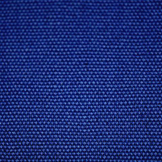 Available in Regular Profile (up to 10" legs) and High Profile. Matching night stand, tall chest and dresser available.